Your heart painting is a reminder that no matter what is going on in your life, how you see you see yourself, or any judgments you have, that you are in your essence a beautiful and eternal part of creation. You being here is important and it is for you to live fully relishing person you came here to be. From birth onwards you are learning what it takes to survive in this world. You make your own rules of who you are, how you fit in, plus get handed many stories by those around you. Whilst our mind focuses on the rules and concepts our spirit knows who we truly are. It whispers and guides us through our gut feelings and heart felt wisdom. This discovery is explained beautifully by Sogyal Rinpoche in The Tibetan Book of Living and Dying:” Two people have been living in you all of your life. One is the ego, garrulous, demanding, hysterical, calculating; the other is the hidden spiritual being, whose still voice of wisdom you have only rarely heard or attended to”. He refers to this hidden spiritual being as our wise guide. Your Unique Heart Paintings serves as a beautiful signpost to help you focus on the true you and is created to honour this part of you. Every colour in your painting has a unique vibration and energetic way of working. I believe we feel colour and have an instinctual understanding of it that talks to us beyond words. The colours bring their own magic too. Your Unique Heart Painting works as a reading, showing the energy that is most important for you to be in touch with right now, and is the most supportive and beneficial for you to allow your love connection to your timeless being. I offer you my thoughts and feelings that arise as I paint, though as the work is intended for you, it will resonate deeper with you and I am sure you will pick up more than I can articulate. I recommend hanging or standing your heart painting in a place where you can look at it every day or use it for meditation. I use you name and date of birth as a resonance to tune in and ask what to paint. Your painting will be on canvas using mainly acrylic paints plus colours that I mix from pigments. Using meditation means there is no need for me to meet my clients before the painting, and I have created many pieces which are given as gifts to people I have not seen, and as far away from me as Australia (I am in the UK). 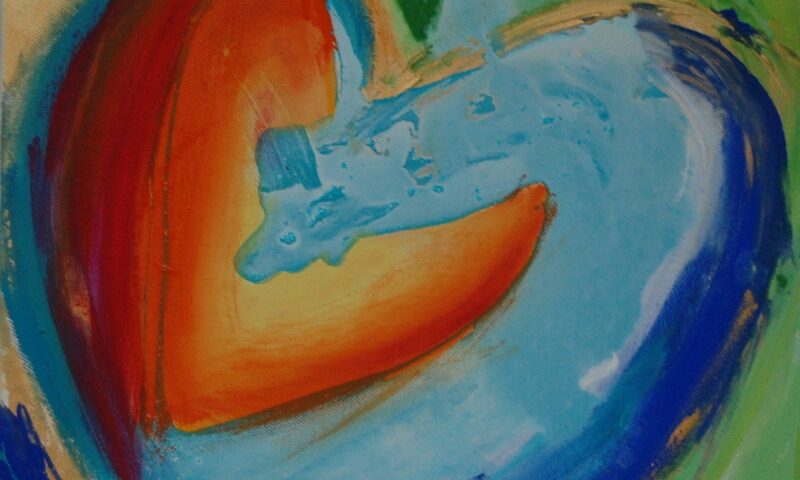 I have painted double heart paintings as special wedding gifts and or an anniversary celebration. I do receive wonderful feedback from delighted recipients, and I continue to be amazed at how the paintings manifest. They are all so different, which is a reflection of how unique we are. If no two snowflakes show up the same why would humans? Your painting will be accompanied with a short reading detailing my experience of what I can see and feel. This acts as a brief introduction. The canvas is ready to put on the wall and does not need framing, unless you choose to. Below is a small selection of some of the paintings created for my clients and some feedback. I love my painting and I love looking at it. I do feel it resonates with me. I loved it from the first moment that I saw it. I knew it was mine straight away. I love the colours, the vibrancy; the comfy feeling it gives me whenever I look at it. “Words can not express the surprise and gratitude that I had when Olivia gave me the painting you had done. It is sitting with pride on the bookcase in the living room so that I can look at it’s beauty each day. “My friend cried when she saw the painting and read everything, she said it was the most beautiful and unique gift she has ever received, she was so moved by your work, the message, everything. “THANK YOU they are BOTH beautiful and I just know that my daughters will love them, as much as I do. “My mum gave me your heart painting as a present for my 50th birthday and I think it is wonderful! I really like the painting. Yellow is my favorite colour and the paint bleeds off the edge of the heart, which signifies effervescence, a kind of explosion of happiness and joy spilling out. The centre of the heart is painted in deeper colours and is where you have used the gold, which I feel reflects a deeper inner core, I like it very much.